In my latest update, I’d like to explain some of the changes the team will be working on over the next few weeks, including changes to the MOT testing service helpdesk and the new inspection manual. In December, we told you that from January 2018, the MOT testing service helpdesk will become part of DVSA’s call centre. Before this took place, it wasn’t run by DVSA, so we couldn’t put calls through between the helpdesk and our standards team and often we found you had queries for both. Now if you call the MOT testing service helpdesk and you have a follow-up technical testing question, they can transfer you to the MOT standards team. This is part of the on-going work we’re doing to join these 2 services, and make it easier for you to get MOT testing support and advice. Once we’ve trained more of our staff to answer all types of questions, we’ll look at whether merging the 2 phone numbers is possible and would improve the service for you. It’s been really good to see that you’ve been engaging with the changes we’ll be making as part of the roadworthiness directive, and giving us feedback on some of our ideas. Your feedback is essential and will help us make sure we make any necessary changes. As you know, the roadworthiness directive means we’re making substantial changes to the inspection manual. We recently published the latest draft of the manual on GOV.UK. Although it won’t come into effect until 20 May 2018, I want to make sure you can start getting to know what's in it and what’s changing. It’d be great to hear your feedback on it, so please let us know if there are any areas we can improve. You may have noticed from the new manual that while the content of the MOT isn’t changing much, there’ll be quite a few changes on how we word MOT failure reasons. It’s important that we make it as easy as possible to find the correct failure reasons within the MOT testing service, as they might be worded or organised differently to before. So, we’ve been doing a lot of testing of prototypes with testers and I’m really pleased with how this has gone so far. It's helped us understand how we can make the service easier to use and defects quicker to find. We’ll continue doing more user testing over the next few weeks. The Department for Transport (DfT) has now published the definitions for the rolling 40-year exemption for vehicles of historic interest, and what modifications are acceptable. They intend that the exemption from MOT for vehicles of historic interest will be administered through the vehicle tax renewal process. It’ll be up to the owners to declare whether their vehicle meets these requirements (if it’s of valid age). DfT also announced the results of the consultation on the first test date for cars this week, which will be staying at 3 years. Before Christmas, we made a really big update to the ‘Check the MOT history of a vehicle’ service, so you can now check if there’s any outstanding recalls on a vehicle. This will not only help members of the public who want to check the safety of their own vehicle but the motor trade industry too. It means they’ll be able to check the safety and legality of the vehicles they’re selling. In December there were 300,000 checks of the service. And, around 25,000 of these checks showed there was still outstanding safety recalls on the vehicle. We’ll be monitoring this, to see if it improves how quickly these outstanding recalls are dealt with. 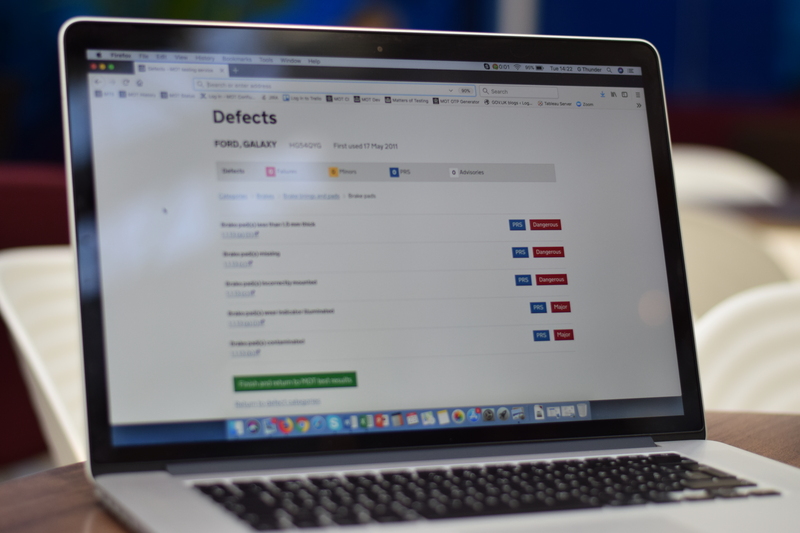 Over the next few weeks, we’ll be working on improvements to some of the administrative processes around garage and tester approvals. In November, the processing of approvals moved to a centralised team. Since then, we’ve recognised that we need to improve some of the processes to make sure we can provide the service needed. Thanks for your patience on this. I’d like to reassure you that the teams at Chadderton are working hard to work through backlogs of approvals for new or changed sites. Over the next few weeks, we’ll be working on our revised approach to risk rating and the implementation of the roadworthiness directive, which I’ll blog more about soon. Following some research we did last year, we’ve finalised the design of the new test pass/fail documentation. It includes more helpful information for motorists on the severity of defects. We’re now getting into the ‘development’ stage so we can switch to the new design as soon as possible. We're hoping this will be in April. As always, please let us know your feedback in the comments. I would hope, that from the date that the new manual is applied to the testing of vehicles, that we are supported and "advised" by our Vehicle Examiners, who at times can be challenging, exacting, very bloody minded and determined in laying down the law. Most of these guys out there are very supportive and helpful, but it would be good to hear that you, DVSA are asking your VE's to support the Testers and Authorised Examiners as this major change takes place. I've owned various Euro 4 vehicles with DPFs, more than a few will smoke even with a new OEM DPF fitted and configured properly through dealer tools. Yet there are still testers out there misinterpreting the test manual - 2 tone horns as fitted by the factor, no a fail yet failed as "emits multiple tones"
Not properly looked through the draft manual as yet, but my biggest gripe as will be for many fellow garage owners is when is the maximum FEE going to be increased to a level that is inline with all the extra checks and extra costs we have had to incur in the last 8 YEARS! This is actually negative inflation. May be DVSA could clarify what is happening to Tyre sidewall instructions. DVSA have indicated that it would be advisable to carryout out 18/19 CPD training and assessment before the 20th May. How can this be carried out when the changes are yet to be finalised with the manual still in a draft state. It appears DVSA are being all defensive to a lot of the blog on here,maybe more and guidance would be better. 'Tyre sidewall markings' has been updated to be included in the latest draft manual. This will be published shortly. Other minor corrections are also being made. We are publishing training materials for the beginning of April to coincide with the start of the 2018 to 2019 training year. No. A person is required to maintain their vehicle in a roadworthy condition at all times, regardless of whether an item is an MOT failure or not. Regarding the new manual draft, no minor for a brake lining almost worn to 1.5mm limit? Current manual section 3.6 G2 the fail is, A brake fluid warning lamp is illuminated or inoperative. Re answer 4. The current Mmnual has no defect categories only pass or advise. Obviously you can mark a defect as dangerous, which is similar, but not the same as in the new manual. Re answer 8. Apologies, there seems to be a typ here. It seems to relate to the brake fluid contamination question again - You would only fail for brake fluid contamination if you could clearly determine it was contaminated. This is considered unlikely, but is a requirement of the roadworthiness directive so has to be included. Hi Julia, I think you'll find Pete is referring to this, copied and pasted from current manual. 2. Check that the brake fluid warning lamp is not illuminated or defective. 1. A fluid reservoir: a. cap missing b. level below the minimum indication when this is shown. Perhaps you could confirm, or set us in the right direction. 1. The press is making a lot of the idea that many older diesels will be instantly failed and removed from the road. Can you confirm if this is generally accepted in principle? If so, has UK Gov undertaken or availed itself of any 3rd party research indicating the numbers of vehicles that may be failed in year 1 as a consequence of this? Further to that research, is there any insight into the demographic of car owners most likely to be affected by this? 2. I have also read that this is a standard we are taking down from an EU directive rather than instigated within the DVSA / DoT. Clarification of exactly what the basis for the rule changes are would again be much appreciated. I'm more than happy for my email address to be used as a means of contact / feedback. There is no truth in this. Default diesel smoke limits for older vehicles are not changing. However, where the vehicle manufacturer has declared that the vehicle can meet a lower smoke limit (displayed on the Manufacturer’s plate) then this lower limit will be used. This will mostly affect Euro 5 and Euro 6 vehicles, but some Euro 4 vehicles may also be affected. Julia, thanks for this helpful clarification! I used to think the old/current system was at best adequate but at least it was workable. The new draft is a complete mess and I was dreading its implementation but actually its that bad I am now looking forward to it. I have read through the draft manual and there are numerous items not in this draft. Things such as furrels corroded. Other items that do not make sense such as brake pad warning wires. On a VAG vehicle you will be changing pads half way through their wear as they come on very early. Another one is checking contamination of brake fluid. How? When we cannot remove the cap. Also I would like to know how we are suppose to know everything that has changed before May 18th when the draft is incorrect unless all the missing failures I spotted are no longer a fail sorry major. As there is so much more to learn and added to the test is the fee finally going up. All the charges to calibrate etc have gone up and the MOT fee always went up in alignment with this. Why not now. 1) class 4 vehicles, goods vehicle not exceeding 3000kg DGW- category N1, definition of N1 goods vehicle not exceeding 3500DGW ????? 2) registration plates particular attention should be paid to delaminated number plates that are no longer reflective, yet you list no failure??? 3) brake fluid level not visible, fail! If you ever worked on cars you would fail nearly every car for having a dirty reservoir as you can never see the level! 4) brake fluid warning lamp illuminated has no black line listed against it meaning no change, yet if it was illuminated it is currently a fail you have it listed as a minor? Mistake? 6) visibility, mirror requirement chart missing to show what position a and b are. 7) headlamps, on switch does not operate etc minor, dip switch does not operate etc major? Surely the headlamp on switch is just as if more important than the dip switch, yet the position lamp switch is a major,??? Switch does not operate in accordance with the requirements, minor???? 9) stop lamps, emitted colour not in accordance with requirements, minor?? Can they be green now then?? 10) reversing lamps must operate automatically when reverse gear is selected, reversing lamp inoperative minor??? Reversing switch faulty fail??? What's the difference and how would you know?? 11) lamps, a mandatory tell-tale for direction indicators or hazard warning lamps inoperative, minor?? How's it mandatory then?? 12) a hazard warning lamp tell-tale must be a flashing light, hazard warning lamp not flashing, minor?? 13) horn, not working properly or in accordance with requirements, minor?? 1 This is correct – not exceeding 3000kg is the limit for Class 4. Not exceeding 3500kg is the limit for N1. Therefore Class 4 and 7 goods vehicles are all N1. 2 Number plate does not conform to the specified requirements. 3 As it says in the text “hydraulic brake fluid level checks are confined to transparent reservoirs or where an indicator is fitted, reservoir caps shouldn’t be removed”. If you can’t see the level because the reservoir isn’t suitable then you can’t fail it. 4 No. We test it now and we are still testing it. The defect categories are new so they are all changes. There will be no change bars when the final version is released as it is a completely new manual. 5 A mirror on a goods vehicle may well be mounted on a bar. The mirror has to have relative movement to be adjustable, but may be slightly loose so the mirror moves, rather than stays in a fixed position. a. An exterior mirror or device that provides a view along the offside of the vehicle. b. An exterior mirror or device that provides a view along the nearside of the vehicle. c. An interior mirror or device which provides a view to the rear of the vehicle. 7 As per the roadworthiness directive. The dip switch is more important as it could dazzle other road users. 13 As per the roadworthiness directive. This inspection applies to the two obligatory rear reflectors that are required to be fitted. There's no mention of what colour they should be! I read something that someone from DVSA had written about Security of Items, The subject being a bit confusing, That they are going to make it easier to understand. IT'S ALL AS CLEAR AS MUD NOW!! Why not also ADD Nearside Mirror's if fitted to a car. Make all mirrors obligatory.. Regardless. Testers will use their knowledge, experience and judgement as a skilled motor mechanic and MOT tester when they're checking brake fluid level. The lamp you refer to may be a multi-functional one and may not be for brake pad wear. Reversing lights are checked on post 2009 registered vehicles due to the Road Vehicles (Approval) Regulations 2009. We continue to consult - your feedback is important to us. ok I assume you have stopped posting comments due to the number of negative ones posted . STOP ASKING US FOR OUR VIEWS AND THEN IGNORING THEM !! YOU ARE JUST WINDING US ALL UP AND COSTING US THOUSANDS OF POUNDS AND WE HAVE TO DEAL WITH CUSTOMERS NOT YOU !! I AM DONE WITH THIS BLOG AND THIS IS THE LAST TIME I AM COMMENTING O'R EVEN LOOKING AT IT . Ok I've seen many errors or contradictions so thought I would list them. Please find answers to your questions below. 1 An N1 is a goods vehicle up to 3500kg. Therefore a goods vehicle up to 3000kg (Class 4) is an N1 and between 3001-3500kg is a Class 7. 4 There are currently no defect categories. Therefore, every item has changed. There is no change bar because we currently test it and that has not changed. When the final version of the manual is published there will be no change bars at all because it's a completely new manual. Instead, a list of changes will be published. 5 A mirror needs relative movement to allow for adjustment. This is why the term ‘slightly loose’ has been used to define a minor defect. 7 Dip switch not operating can dazzle other road users so is a major. Headlamp switch not operating may mean only a delay in them coming on, but if they don’t work they will fail for being inoperative and for headlamp aim not tested. 8 It is there to comply with the directive, but may is not unlikely to be used. 9 The lamps can’t be green, but if they are then it’s a minor. 10 If the reversing lamps don’t work it’s a minor. If they work, but don’t go off when taken out of reverse gear, or are operated by a manual switch, then it’s a major. 11 It's mandatory under both type approval and the Road Vehicles Lighting Regulations. However, the directive considers it to be a minor defect. 13 The manual is clear on this. The only difference is the relaxation of the defect criteria from a current failure to a minor defect in line with the directive, which some testers feel goes against the grain. However, testers are not required to agree with the standard, only to apply it as per the manual. Seriously? Brake lights cannot be green (obviously!) but if they are it's a minor???? There are many things in new draft which are contradictive. This all needs looking at by somebody who actually does MOT's. with reference to item 1,can you not understand the point being made by shaun?this being that class 4+7 both being n1 can and will confuse some people,item 6,does this mean we are retaining the current manual?cos if not referring to it is gonna be a little difficult,item 2,no plates not meeting reqmnts,i have also mentioned this in a previous post you moderated inasmuch we are assessing them by eye but the fail criteria refers to anpr visibility which is WAY beyond our remit and equipment,item 9,lamps aren't allowed to be green but if they are itll still pass!you need to state stuff like that CLEARLY in the manual,item 11,we don't get given construction and use/type approval regs to use and if we did we still wouldn't be allowed to test to them,again way beyond our remit.please keep in mind that none of this is aimed for you or your dept specifically,this is a draft manual and we are raising major issues with its content,layout,terminology and clarity.this was the whole point of releasing the draft to us yes?this comment will likely be moderated out of existence yet again but regardless of that PLEASE pay attention to the concerns being raised or releasing the draft to us was a pointless exercise in the first place.i do however have a horrible feeling that what we have seen is what we are gonna get regardless of any concerns in which case all that's been achieved is to waste a lot of peoples time.as always I hope to be proved wrong. Having read the draft copy there is a lot of supposition on the failure items where bearings are "likely to break up" etc. We cannot second guess what is likely to happen, only fail what is put before us therefor the current wording is correct. Also where does noise fit into a check on wheel bearings ? roughness and play yes nothing else. If taken to a court of law you would lose due to the wording "contamination" of brake fluid being a prime example contaminated with what ? , discolouration is about as close as you could get and even that is doubtful. Does the person who came up with the "new" version have any background in the motor industry ? it seems unlikely. As a skilled motor mechanic and MOT tester, you need to make numerous assessments using your knowledge, experience and judgement. Noise is a prime indicator of a wheel bearing being rough. You would only fail for brake fluid contamination if you could clearly determine it was contaminated. This is considered unlikely, but is a requirement of the new oadworthiness directive so has to be included. So in general brake fluid when new is a very clear, translucent, yellow. You can see through it. Now as a Skilled Motor Mechanic/Technician of over 40yrs, and MOT Tester of 30yrs, if the brake fluid is now a dirty, muddy colour and you can no longer see through it, then It Is Clearly Contaminated. It is generally Contaminated with residues from the braking system that finds it's way back into the reservoir over time. This can be determined if the outside of the reservoir is clean. So is this still "considered unlikely" in this circumstance. What we're all looking for here is a bit of proper guidance that we no longer get from the 5 Year Refresher Course, or the Local VE. I'm only part way through, lots added lots removed, lots of new dates to remember. On a serious not It Needs To Be Formatted Like The Old Manual. That will cut out a lot of repetition of phrases, ie; " A ‘light source’ means any bulb, LED or other means of emitting light." And reduce the amount of pages. And obviously a lot easier to use. Hope you can take this on board, you must already have this in mind! The proposed new RFR for "contaminated brake fluid". How are we to assess this, and when the presenter asks what it's contaminated with how are we supposed to reply? Just two problems that struck me to start with. Brake fluid contamination would need to be very obvious. If the tester is not sure that the TPMS lamp is indicating a system malfunction they should err on the side of caution. Seems you only appreciate feedback when it doesn't point out glaring mistakes and omissions on your part. A comment not passing your "moderation" is an indication that the observation is correct. Reversing lights will now be tested, but if they don't work it's a 'Minor'. What is the point of testing it? If it doesn't matter if it works or not. brake pad warning light on (most pads have 5mm of thickness when sensor kicks in) - Fail! How can this be, we test to minimum standards, before i was told by dvsa you cant measure 1.5mm with wheel on, so unless its grinding, pass and advise. Why are we now faiuling brakes which are half worn in most cases? Differents standards of testing being implemented here!